with mahogany frame. Consist of 4 pcs dining chair and 1 pcs round dining table 110 x 110 x 76 cm, with glass on top table, thickness of glass 5 mm. AR Set-004 = >FOB Semarang port-Indonesia $ 190.00 / set .Good quality and warranty. Material could be replace between banana abaca, banana leaf, rattan, water hyacinth and sea grass. Nice for home, dining room, hotel and restaurant. For further information about our products, please visit our online catalog and contact us. 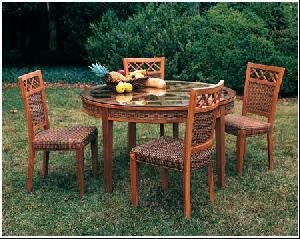 We produced many items of outdoor, indoor and rattan/woven furniture . Some of new design not listed in our online catalog, so contact us. Minimum order quantity is a 20ft container (not this set only but mix items allowed).